Rob was born in Calgary, Alberta. He developed a fascination with animals as a small child living with his family on an acreage in Bearspaw where he communed with nature and learned to ride horseback. During adolescence Rob was hired by a local rancher as a summer farmhand where he cut his teeth as a rancher which would develop into his passion and career. Rob excelled in academia from a young age. In grade nine at Red Deer Lake School he received the Governor General award for outstanding academic achievement. In grade 12 at Lord Beaverbrook High School he earned three awards for exceptional academic, athletic and social aptitude. After two years of studying for a Bachelor of Science in Agriculture at the University of Alberta his high marks allowed him to skip two pre-vet years of study and go directly into veterinary medicine at the University of Saskatchewan where graduated with distinction as a Doctor of Veterinary Medicine in 1978. Rob practiced in a large animal clinic in Strathmore for several years before purchasing, with help from his father, the Three Walking Sticks Ranch, a cow/calf operation in the Porcupine Hills west of Claresholm. He loved the ranch and loved working with cattle, particularly when riding his favourite saddle horse, Bugsy. His skill in breeding produced exceptional and widely sought-after beef. 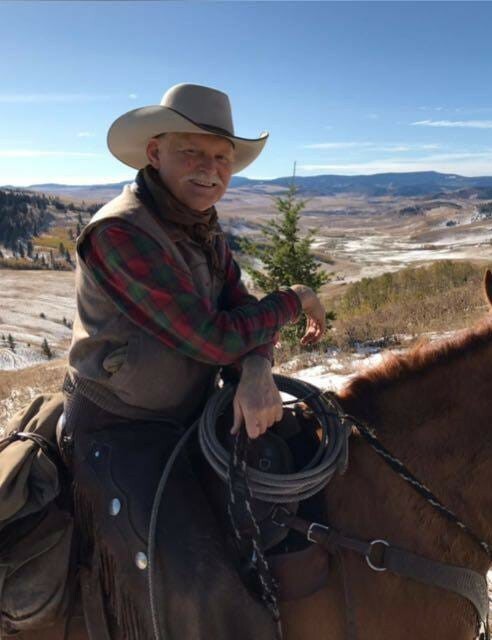 Rob participated in brandings, round-ups, weaning and other ranching activities (which might have included a wee dram of whisky or a cribbage board now and then) but his greatest joy was sharing the ranching way of life with his kids. He worked, and played, alongside neighbours and local ranchers developing wonderful, lifelong friendships. His skill as a vet was valued and often called upon by his community. During the financially lean years of Alberta’s BSE outbreak he worked full time as a vet at the Claresholm Veterinary Clinic in addition to tending the ranch. His working days were long indeed. Rob was a respected and active member of the community who taught gymnastics to children and helped lead the Claresholm 4H chapter. He was an instrumental part of the East Trout Grazing Association and Ducks Unlimited for 35 years. The Hills and his community inspired him to write cowboy poetry which he read at many public events. Rob’s hobby of playing the bagpipes grew into esteemed and in-demand performances at local events, especially annual Robbie Burns suppers. He held the position of Pipe Sergeant in the Lethbridge Legion Pipe Band and made lifelong friendships with his band mates. He was very proud of his two sons who developed piping talents that exceeded his own. Rob is survived by his son Leigh (Bronwyn) and their children – Isolde, Cassian, Finnian; his brother Douglas (Sandra) and their three children; his sister Mary Jane (Ty Pfeifer) and their three children; his sister Jessie (Spencer MacCosham) and their four children; and his parents Merritt and Benni Chisholm. He also is survived by his estranged wife Robin, children Gavin, Shannon, Alec (Laura) and grandsons John and Gordon. During the years of Rob’s illness his three siblings and oldest son formed a dedicated support group. His wonderful neighbours and friends provided Rob with unwavering assistance, compassion and sincere kindness–they truly were an inspiration. We would like to thank and express our deep appreciation to the many caregivers at the Claresholm hospital for the high level of care and comfort provided to Rob. A Celebration of Rob’s Life will be held at 2:00 PM on Monday, November 26, 2018 at the Claresholm Community Centre (5920- 8 Street West, Claresholm, Alberta) followed by a reminiscing lunch. All friends and acquaintances of Rob are welcome to attend. In lieu of flowers, donations to the Claresholm and District Health Foundation P.O. Box 2638, Claresholm, Alberta T0L 0T0 (www.cdhealth.ca) in Rob’s name will be gratefully accepted.